When it comes to investing money, most Canadians work with one of the big five banks. So, when Canada’s largest independent online brokerage Questrade launched its low-fee robo advisor platform, it wanted everyone to know. However, no one outside of online traders knew about the company. Research showed that Canadians also don’t know how much they are paying in investment fees. This feeling comes to a head each year when consumers face their financial advisor to review and update their investment accounts. The brand and agency No Fixed Address decided to turn the tables on advisors by putting them in the shoes of consumers unaware of hidden fees. 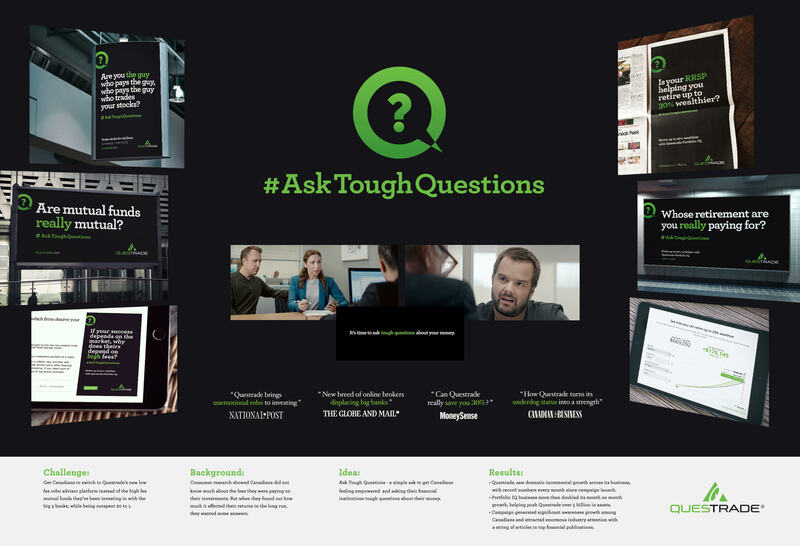 A campaign was created to inform, empower and encourage investors to “Ask Tough Questions” about their money. The team kicked it off with TV ads that stood out in stark contrast to the upbeat bank ads with happy customers and smiling advisors. The first spot shows a woman asking a pointed question about fees. In another, a man poignantly explains to the advisor that they aren’t talking about a game, but his family’s future. In each spot, the financial advisor responds with a pained and awkward look. Questrade also asked a series of provocative questions like, “Are mutual funds really mutual?” and “Whose retirement are you really paying for?” at strategic locations like airports, along commuter routes, and alongside articles on investing. On Questrade’s website, the brand used a calculator to show how the average Canadian investor can retire up to 30% wealthier by using its low-fee platform. The campaign drove immediate awareness growth among Canadians. More importantly, the brand saw dramatic incremental growth across its business. Questrade's Portfolio IQ business more than doubled its monthly growth, increasing to more than $5 billion in assets.